Sewing For Little Girls...So Much Fun! 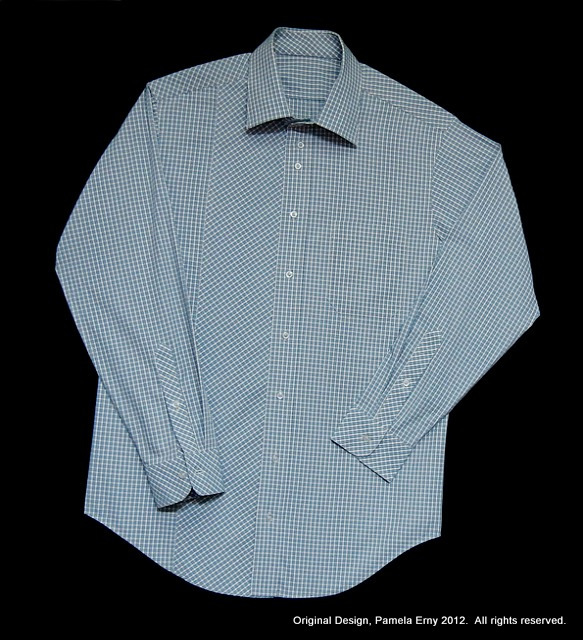 "Wrinkle Free" does not equal "Hassle Free"
Angled Yoke and Blue Checks too! This is a pretty darn good "final muslin" of a nicely detailed shirt...or so I thought. I was very pleased with the bias details on the right side Front, Cuffs, and Sleeve Plackets. But more than that....this new pattern draft for my DH Roger fit him perfectly, and he really liked the design details! In fact, even though this shirt was the "final muslin", and only made with serged-then-topstitched seams...it looks good enough to actually wear, don't you think? [that funky bit at the left shoulder is just from not pinning it perfectly to my photo-wall] And even more than that...this fabric was a bargain, and I was pleasantly surprised when it arrived to see that it didn't look or feel "cheap". So, OK then...after I tossed this one into the wash to rinse out the starch I used to stabilize some of the bias details, I was ready to move on to another shirt for Roger, made from the same checked fabric in a different color. I was just finishing the prep work on the final pattern for the second shirt when this blue one was ready to come out of the dryer. I handed it to Roger and he put it on, or rather he tried to put it on. Despite pre-washing/drying the fabric...this nice blue shirt shrank! Not a little bit...the sleeves and body were 1/2" too short. No big deal on the body-length, very big deal with the sleeves. And it shrank a bit width-wise too. OMG! How the hell did this happen! I may have mentioned this before. I am a compulsive pre-washer...I always, I mean always wash shirting fabric once in hot water/hot dryer, then again in warm water/warm dryer. And I measure the length and width before and after. This fabric passed my obsessive pre-wash evaluation with just a tiny bit of shrinkage. Nothing shrank during the construction, and I always press with plenty of steam. So this extra shrinkage surprise really was a surprise! The thing is, Roger really likes this checked fabric in the other color. So against my better judgement, I am going to make another shirt for him with this fabric. But this time in addition to my usual pre-wash routine, I am going to use my hottest wash and dry cycles one extra time, and then for good measure (ha, ha), I'll wet the yardage, spin out the excess water, and dry it on hot one more time. Not (usually) being a foolish woman, I did wash/dry the now-shrunken blue shirt you see here to see if it would shrink again. It didn't. So I feel only a little anxiety about the other fabric. What am I going to do with this blue shirt? I considered pinning it on my wall as a reminder to never again buy cheap shirting fabric from that really huge online fabric store...no matter how nice it looks. But in the end I donated it...it's a nice enough shirt, someone will get use of it. What did I learn? To wait until my always reliable online fabric store and wholesale sources of "better" shirt fabrics have what I am looking for, and until then to shop from my considerable stash. What are those reliable sources for menswear shirting that I use, you ask? And one more thing. Before another menswear shirt gets sewn by my hands.....my hands are going to get busy making a few tops and a few pairs of pants for myself. Yay me! Wow that was a surprise! And not a good one. I don't have a secret wholesale source - but I do buy almost all my on-line (ie - good) fabric from Ann at Gorgeous Fabrics. I used the mega cheapy store once - that was enough. They did not work for me either. Also your shirt interfacing is my new favorite.. Thanks Again! Have you submitted a complaint to that really huge online fabric store? I once had an enormous problem with fabric during prewashing which rendered the fabric unusable for the project I had obtained it. I filed a complaint with the really huge online fabric store from when I had purchased the fabric. They solved the problem without me asking for a resolution. What a tale you have about that fabric-I thought stuff like that only happened to me! I learned a lot from your post=thank you. I love that shirt and thought dang, my hubby would look mighty good in that shirt! And THANK YOU for eliminating that word verification stuff-so annoying! The nerve of that cheap fabric. I am scared now because I only washed and dryed the fabric I am using for my husbands shirt once. If that happened to me I would be crying right now. It happens to the best of us, Pam. Sometimes fate just rears its ugly head despite all our efforts to control it. It does look great, beautiful details. Hi Janelle, No...I didn't bother to contact them this time. I have found that since "Stephen" is not involved with the operation of the company any longer it seems that customer service there is not what it used to be. Besides, who knows, it might have been my fault in some way...so, I'll live with it. The shirt is gorgeous and I love the bias but it's really too bad that it shrank. Makes me glad I'm a bit paranoid about pre washing, as in at least 2-3 times including knits! I really like that shirt you made. I know that you made someone else happy, the recipient of the brand-new, beautifully made shirt. Its too bad that you have to repeat your work but I am glad that you gave the shirt to someone else. Great shirt and great look...poor Roger. Absolutely stunning details. I love it when my hero actually experiences real life drama just like the rest of us. I continue to learn daily from you. Great shirt with great details and style. I continue to learn daily from you, Pam. I do enjoy knowing that my "hero" has little bumps along the way and still lives a quite normal life just like all of us out there in "we wanna be a sewista like Pam" world. So sorry about your frustration! But it does make me feel resolved to continue my compulsive fabric prep- keep washing and drying until there is no change in the width and/or length. Then once more! Fabric shrinkage is sometimes a mystical thing. I too am very obsessive about prewashing and and drying. Once the garment is made it does not go back in the dryer. But I have a pair of pants that started out long enough to wear with heels, and I mean HEELS, and I can only wear them now with flats. Never shrunk widthwise, just lengthwise. B- zarre! What a nasty surprise! Thanks for sharing the sad tale of woe. I hope the next shirt stays the right size. What a great idea, Karla! I'll take him to the automatic car wash...! I'd cut the blue shirt down for you then you'd have 'matching' shirts. This has been my biggest problem too, with shirting fabric - the shrinkage! My husband was able to wear the shirt I made for him once and then after I washed it (mind you, I prewashed and predried) it was unwearable.